What if your child had to go hungry on a regular basis? For 1 in 4 children in Washoe County, this isn’t a theoretical question – it’s reality. We’re talking about local children, many of whom likely go to school alongside our kids. This situation can happen for many number of reasons, but the fact remains that in our community there are too many children who are only getting their meals at school. Unfortunately, our community is not immune to this issue, and fortunately, there are people helping to make things better. Meet Reno local Cory Dayton, the founder of fundraising event Headlock on Hunger, and a father himself. About 5 years ago, Dayton found himself in the position described above – unsure he’d be able to feed his children. Sparing you the complex details, Dayton was going through a divorce and his spousal support calculations were misestimated due to some overtime he had received in the past. He plead with the judge, but to no avail. Fortunately, he received help from his girlfriend – she made sure the children never missed a meal and that they had presents under the Christmas tree. It wasn’t until years later that the impact of this selfless act really hit him. 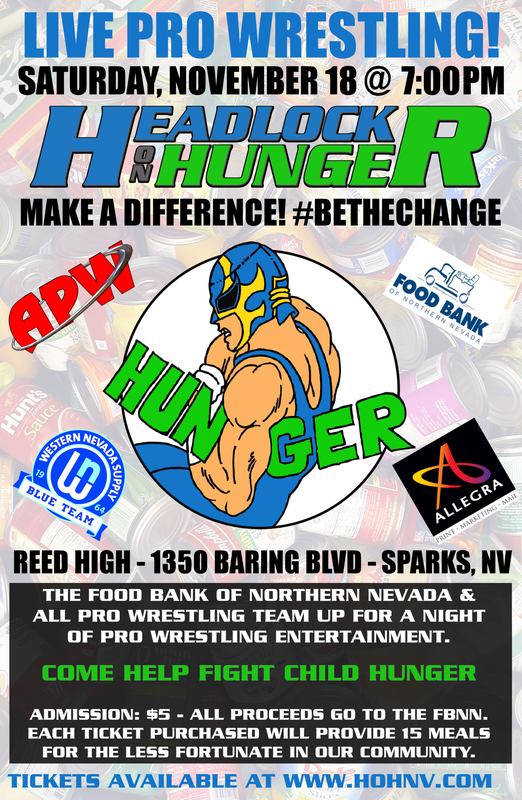 So moved by the experience, Dayton later created Headlock on Hunger, a live professional wrestling fundraising event that benefits the Food Bank of Northern Nevada. Admission is only $5, which can provide 15 meals to children in need. Isn’t that amazing? Below are the details for this year’s event. We strongly encourage you to attend or support this cause however you can.